I’m a huge fan of workplace routines. I use them on a daily and weekly basis, and I truly believe they play a major role in my productivity. Workplace routines are like rituals—specific, pre-established ways of doing things that need to happen on a regular basis. 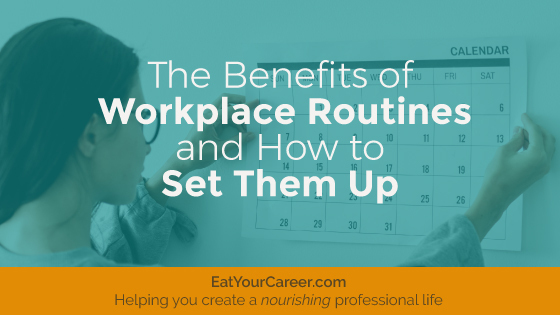 Most people utilize a variety of routines in both their personal and professional lives. For example, you may have a morning routine at home. You have a specific time by which you need to get up, wake the kids, get in the shower, make the kids’ lunches, send them out the door, and jump in your car to head to work. This time-bound, clearly ordered set of activities is your routine. If you follow it, you’ll create consistent positive results: the kids will get to school with lunch in hand, and you’ll get to work clean and on time. As a professional, you can utilize a wide variety of similar routines in the workplace. Doing so will help enhance your ability to get things done, while also creating more clarity and peace of mind. When you follow a routine that really works, you can feel confident that the outcome will be the same each time. Having a routine means you don’t have to think too hard about how or when to do something; you know exactly what to do and when to do it because you’ve already figured that out. This reduces both the time and stress of decision-making throughout your day. Routines eventually turn into habits, meaning you no longer have to consciously choose to do them. Instead, they become practically mindless and require significantly less effort. It feels good to engage in routines because they are a predictable pattern. Perhaps most importantly, workplace routines save time. The more you ritualize a process, the more streamlined it becomes. You naturally become more efficient at it because you learn its rhythm. You know what to expect at each step so your brain is always subconsciously preparing you for what’s next. When establishing new workplace routines, I like to write them out using a checklist style format. This makes it more conscious and allows me to see exactly what I’m committing to. The act of writing (or typing) the routine, adds an important element of intention. Plus, I can use the checklist each time I engage in the routine to remind myself of the various steps—at least until it becomes a habit and I no longer need the reminder. Consider starting with the following. Remember to list out all steps in order and define times associated with each one. Start-of-Workday Routine: What are the specific, deliberate steps you need to engage in to start your workday in a positive and productive manner? Mid-Day Routine: What are the specific, deliberate steps you need to engage in at the middle of the day to keep yourself on track and motivated? End-of-Workday Routine: What are the specific, deliberate steps you need to engage in at the end of the day to wrap things up neatly and set yourself up for success tomorrow? Transition Home Routine: What are the specific, deliberate steps you need to engage in as you transition home to leave work behind and prepare to participate fully in your personal life? Finally, allow me to add a few tips as you begin setting up and using your new workplace routines. Allow for Flexibility: Don’t plan on being perfect! Your routines are there to support your success. Should you forget about them or fall out of the habit, don’t beat yourself up. Try to figure out what happened; you may need to adjust your routines to better work for your needs or simply recommit to the process. Create Reminders: Don’t expect your routines to become habitual immediately. You’ll probably have to remind yourself to do them for several months before they get fully engrained. Remember to use your checklists! You may also want to add reminders on your calendar or phone at certain times of day to keep you on track. Make Time for Them: Yes, workplace routines are supposed to save you time in the long-run. But you also need to make time for them in the moment. When you’re busy, it can be tempting to set them on the backburner. But beware: The busy times are when you need to rely on your routines the most. That’s when they will provide the most benefit. Don’t get shortsighted just because you have a lot on your plate. Done consistently, your routines will help make your plate bigger! I hope you enjoy the process of creating reliable, productive workplace routines as much as I have.